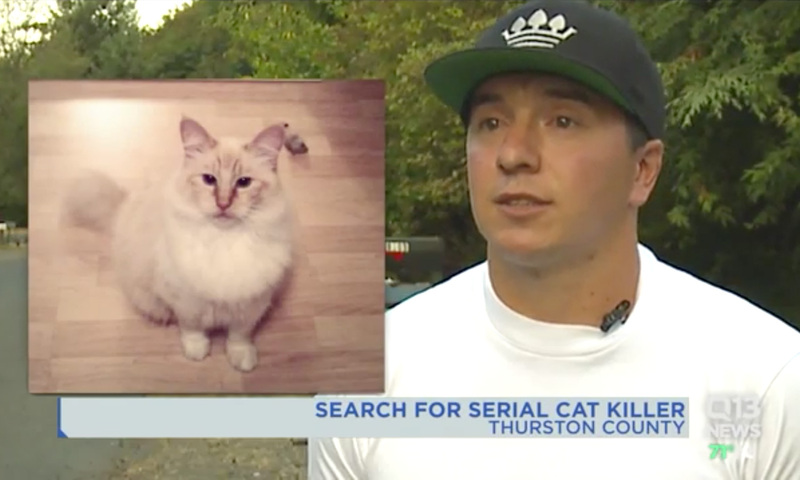 OLYMPIA, Wash. — Thurston County Animal Service Officials are going door-to-door looking for clues, and warning neighbors of the dangers of what they’re calling a serial pet killer. So far, officials have found seven mutilated cats in Thurston County. All the crimes are believed to be committed by the same person, officials say. On Saturday, Officer Erika Johnson went door-to-door talking to people in one of the neighborhoods where one of the cats was found. “I’m trying to keep the story alive to get to the bottom of this,” said Johnson. Johnson has been the one who notified several of the families that their beloved pets have been intentionally killed by a person. A job, she says, is not easy. “It’s very difficult, because I know I’m going to be delivering the worst news they’ve probably had in a long time,” she said. Johnson says she knows these pets are being killed by a human because of how the bodies are mutilated; she says they have been put on “display” in public places. Johnson says her main goal is to bring this suspect to justice, but she also wants the community to be aware of the current dangers of leaving their pets outside overnight. Johnson and other officials say what is most concerning is people who commit these sorts of violent crimes toward animals, sometimes will start committing violent crimes towards humans. If anyone has information that can help identify a suspect, contact Thurston County Animal Services at (360) 352-2510. Pasado’s Safe Haven is offering a $1,500 reward and Q13 News anchor and Washington’s Most Wanted host David Rose will match it so that’s $3,000 if your tip leads to an arrest and conviction in the case.